WASHINGTON, Sep 22 2012 (IPS) - In a move certain to ratchet up already-high tensions with Iran, the administration of President Barack Obama will remove a militant anti-regime group from the State Department’s terrorism list, U.S. officials told reporters here Friday. The decision came several days after some 680 members of the Mujahedeen-e-Khalq (MEK), or People’s Mojahedin, were transferred from their long-time home at Camp Ashraf in eastern Iraq close to the Iranian to a former U.S. base in at Baghdad’s airport in compliance with Washington’s demands that the group move. The transfer leaves only 200 militants at Camp Ashraf out of the roughly 3,200 who were there before the transfers began. Most analysts here predicted that the administration’s decision to remove the MEK from the terrorism list would only worsen already abysmal relations with Iran and possibly make any effort to defuse the gathering crisis over its nuclear programme yet more difficult. “Delisting will be seen not only by the Iranian regime, but also by most Iranian citizens, as a hostile act by the United States,” Paul Pillar, a former top CIA analyst who served as the National Intelligence Officer for the Near East and South Asia from 2000 to 2005, told IPS. “The MEK has almost no popular support within Iran, where it is despised as a group of traitors, especially given its history of joining forces with Saddam Hussein during the Iran-Iraq War,” Pillar added. The decision followed a high-profile multi-year campaign by the group and its sympathisers that featured almost-daily demonstrations at the State Department, full-page ads in major newspapers, and the participation of former high-level U.S. officials, some of whom were paid tens of thousands of dollars to make public appearances on behalf of the MEK. Officials included Obama’s first national security adviser, Gen. James Jones, former FBI chief Louis Freeh, and a number of senior officials in the George W. Bush administration, including his White House chief of staff, Andrew Card, attorney general Michael Mukasey, and former U.N. ambassador John Bolton. Created in the mid-1960s by Islamo-Marxist university students, the MEK played a key role in the 1979 ouster of the Shah only to lose a bloody power struggle with the more-conservative clerical factions close to Ayatollah Ruhollah Khomeini. The group went into exile; many members fled to Iraq, which they used as a base from which they mounted military and terrorist attacks inside Iran during the eight-year war between the two countries. Its forces were also reportedly used to crush popular rebellions against President Saddam Hussein that followed the 1991 Gulf War. During a brief period of détente between Washington and Tehran, the administration of President Bill Clinton designated the group as a Foreign Terrorist Organisation (FTO) in 1997 based in part on its murder of several U.S. military officials and contractors in the 1970s and its part in the 1979 U.S. Embassy takeover, as well as its alliance with Saddam Hussein. 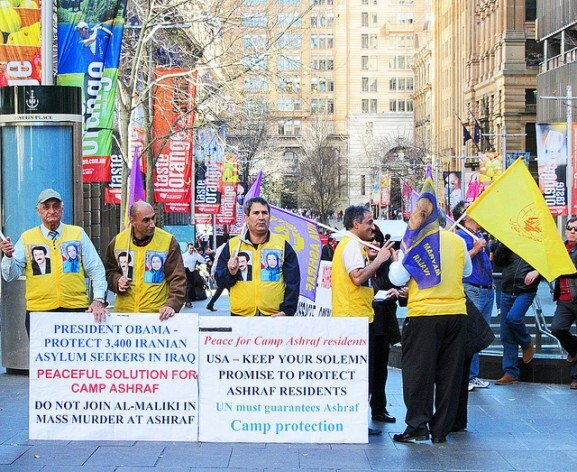 When U.S. forces invaded Iraq in 2001, the MEK declared its neutrality and eventually agreed to disarm in exchange for Washington’s agreement that its members could remain at Camp Ashraf as “protected persons” under the Geneva Convention, an arrangement that expired in 2009. The government of Prime Minister Nour Al-Maliki, however, has been hostile to the MEK’s continued presence in Iraq. Two violent clashes since 2009 between Iraqi security forces and camp residents resulted in the deaths of at least 45 MEK members. Last December, the UN reached a U.S.-mediated accord with the MEK to re-locate the residents to “Camp Liberty” at Baghdad’s airport, which would serve as a “temporary transit station” for residents to resettle in third countries or in Iran, if they so chose, after interviews with the UN High Commission on Refugees. Until quite recently, however, the group — which Human Rights Watch (HRW) and a significant number of defectors, among others, have described as a cult built around its long-unaccounted-for founder, Massoud Rajavi, and his Paris-based spouse, Maryam — has resisted its wholesale removal from Ashraf. Some observers believe Massoud may be based there. Secretary of State Hillary Clinton’s increasingly blunt suggestions that the MEK’s failure to co-operate would jeopardise its chances of being removed from the terrorism list, however, appear to have brought it around. The MEK claims that it halted all military actions in 2001 and has lacked the intent or the capability of carrying out any armed activity since 2003, an assertion reportedly backed up by the State Department. Earlier this year, however, NBC News quoted one U.S. official as confirming Iran’s charges that Israel has used MEK militants in recent years to carry out sabotage operations, including the assassination of Iranian scientists associated with Tehran’s nuclear programme. “The Iranian security establishment’s assessment has long believed that foreign intelligence agencies, specifically the CIA, Israeli Mossad, and the UK’s MI6 utilise the MEK for terror attacks on Iranian nuclear scientists, nuclear sabotage and intelligence gathering,” noted Seyed Hossein Mousavian, a former senior Iranian diplomat and nuclear negotiator currently at Princeton University. That view was echoed by the National Iranian American Council (NIAC), which noted that the decision opens the doors to Congressional funding of the MEK and that leaders of the Iran’s Green Movement have long repudiated the group. Another casualty of the decision may be the credibility of the FTO list itself, according to Mila Johns, a researcher at the National Consortium for the Study of Terrorism and Responses to Terrorism at the University of Maryland. A very unwise and stupid move by this administration to please Israel. Terrorists need to stick together. An enemy of my enemy is my friend, so the US and MKO are bedfellows in crime.